The Evansville Firefighters Credit Union is proud to offer the latest in Mobile Banking for both Android and iPhones. Find your balance, transfer money, and even deposit checks via the mobile app by just taking a picture! 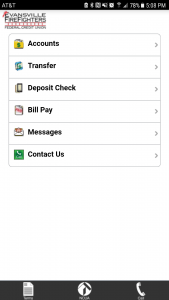 To get started with Mobile Banking, just download the app for your Android or Apple device from the links above. Once you start the app, you will use your online banking account login to get started.